But I can’t help it. 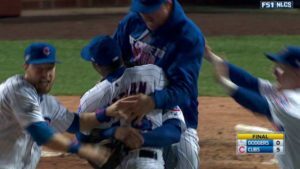 Growing up in Chicago and rooting for Ernie Banks, Ron Santo, Billy Williams, Fergie Jenkins, Randy Hundley, Don Kessinger, Glenn Beckert, Jim Hickman, Bill Hands, Phil Regan, Kenny Holtzman, etc., it’s impossible not to get caught up in the Cubs first appearance in a World Series since 1945. There are a lot of things more important in the world tonight. I know that. But for generations of Cubs fans, this is a special night. Fair warning: I will probably act like an idiot for the next week or so. I ask your indulgence in advance. We can go back to carrying the weight of the world after the Series.